Bobbie Has Her Mommy Trained Perfectly! Just a quick note to say Happy Holidays and to let you know that Bobbie is enjoying the holiday season. 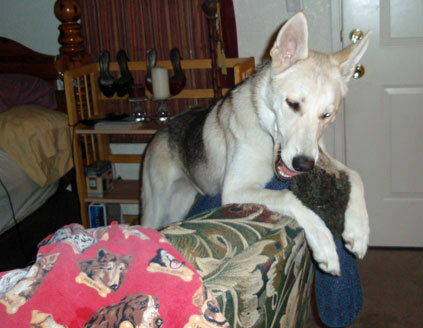 Here’s a quick pick of her favorite doggy game “drop the hedgehog over the back of the chair so mom will pick it up”. She finished her basic obedience training thanks to Sirius k9 and she’s been an absolute joy. Take care and happy holidays!